Carbon fibre is the wonderful hi-tech material that everyone wants to use. Carbon fibre composites make structures lighter, stronger and more rigid and, unlike metal structures, corrosion resistant too. 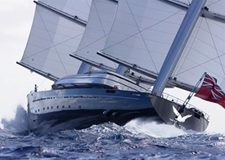 In the superyacht sector, Magma Structures used high performance carbon composites to build the masts and Dyna-Rig sailing systems for the world’s top three privately owned superyachts. 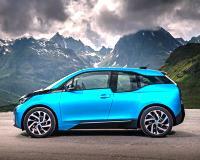 Carbon composites have already driven a revolution in aerospace and wind energy, and car manufacturers like BMW are now using the weight saving benefits to reduce energy consumption in their i3 electric car, selling over 100,000 since 2014. But, despite growth of 10 percent year on year in the use of carbon fibre, its cost has held back further use in major vehicle production lines. In the past big manufacturers in areas like the car sector have been slower than some other industries to embrace new materials, but the growing demand for energy efficiency is putting more pressure on manufacturers to use these types of materials. EU legislation in the automotive industry requires 85% of a vehicle to be recyclable at the end of its life, for example, and this naturally has a cost. When Ford changed their Ford F-150 pickup chassis from steel to aluminium it took six years and cost Ford a billion dollars. Factors of both legislation and environmental responsibility are driving a change in focus for most companies that are currently using carbon fibre, with many major companies in the UK now leading the way. 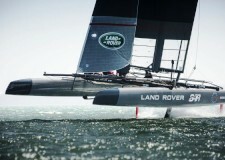 Land Rover BAR, for example, are working to ensure that carbon fibre process waste and end-of-use components from their America’s Cup test and race boats are recycled as far as possible, to promote the most economic and environmentally efficient use of this valuable material. 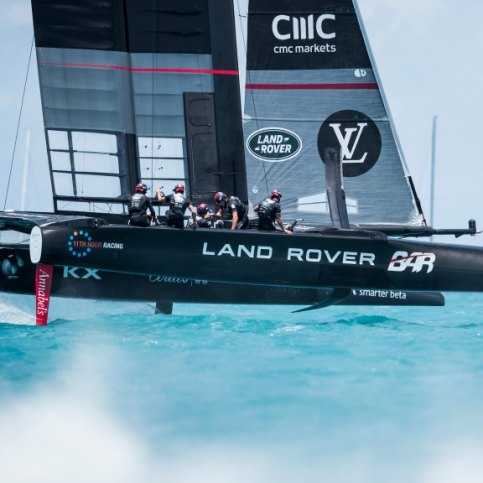 Land Rover BAR also aim to significantly increase the application of recycled composite materials during the build of race boats for the next America’s Cup. So, whilst carbon fibre offers a strong material that companies around the world increasingly love, some recycling aspects still need to be addressed. To ensure a sustainable future, carbon composites must deal with both the manufacturing and end-of-life waste that will inevitably be generated from carbon fibre structures. Continuing growth in the use of carbon fibre around the world and in multiple industries inevitably produces peaks and troughs in supply, creating two new challenges. The first is how to reduce costs, to ensure that carbon fibre composites can compete with other high performance materials, and the second is how to avoid future carbon fibre supply and demand imbalances. Carbon fibre is a novel high technology material, but it will generate future waste, and processes need to be put in place today to develop high quality recycled materials suitable for ongoing use. To become the strong, light composite material industry demands, carbon fibres are bonded together with matrix materials .Some manufacturing methods rely on premixed (often known as prepreg) sheets, comprising the carbon fibre reinforcement, and a matrix of polymer resin, such as epoxy, to bind the reinforcement together. This method of build often leads to manufacturing waste in the form of unusable offcuts from the build components. Inevitably even carbon fibre structures can some to the end of their life, and will require recycling. Andy Shaw – Managing Director, Magma Structures. Apart from a need to recycle existing carbon fibre products, current manufacturing technologies result in an unusable proportion of carbon fibre used being wasted during the conversion and component manufacturing phases. 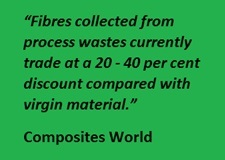 The first recycling challenge is to separate the high strength carbon fibres from the matrix. 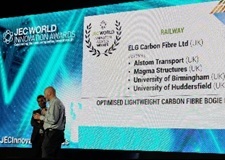 Recycling company ELG Carbon Fibre, Magma Structures’ partner in a new JEC award winning lightweight carbon fibre rail carriage bogie venture, has created a novel process to recover the high strength materials. Since 2009 the company has been recycling carbon fibre by burning off the polymers. 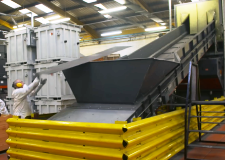 In its recently expanded UK facility, the ELG process reuses the extracted carbon fibre by forming it into cloth and mats, that can then be handled by a variety of production processes similar to those used in the first cycle. It is this material that Magma Structures is using in the new lightweight railway carriage bogie. Global carbon fibre demand is estimated to increase to 180,000 tonnes by 2021. The use of recycled carbon fibre as part of global production helps mitigate increased demand and supply capacity risk, providing significant additional carbon fibre tonnage from existing production capacity. This carbon fibre waste can be recovered and converted to new products, using less than 10% off the energy required to produce the original carbon fibre and fulfilling legislative and sustainability targets. Carbon fibre still costs substantially more than most metals on a cost per kg basis, although this cost difference is greatly reduced, or in some cases nullified, when applied to the final as-built structure. Cheaper recycled material will obviously help to lower the economic change-over point. As carbon fibre composites are now used in components with shorter lives, end-of-life can be anything from 2 to 40 years. Efficient recycling therefore has big implications for overall carbon fibre cost in the future. The good news is that carbon fibre composites last a long time. The current generation of electric cars and wind turbine blades won’t be heading to the scrapyard or a hole in the ground for another decade. So the recycling solutions being developed by ELG and Magma Structures are a great way forward for the future.